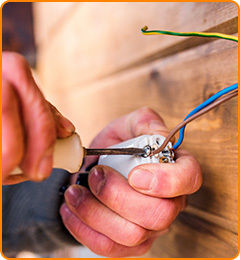 Call us when you are having an electrical emergency. Our phones are on 24 hours a day, seven days a week. We know how frightening it can be when you smell something burning, or have a power outage, or see smoke coming from an outlet. You have no way of knowing if the problem is small, or if you really are having an emergency that could put you and your family’s safety at risk. Don’t take any chances. Call for help. If there is smoke in the house, call 911. If it is safe to do so, shut off your house’s power. If you can safely use a fire extinguisher to extinguish any flames, do so. Then get out of the house, and call us to come out and check your electrical systems. We’ll get there fast, and we won’t leave until we’re certain that your electrical system doesn’t pose any threat to your home or your family. If someone has suffered a serious electrical shock or electrical burn, call 911. Then, call us right away so we can make sure no one else is injured. Never use water to try and put out an electrical fire. Never approach downed power lines. Never touch live wires, or wires that may be live.